The acetic acid and other components of apple cider vinegar are known for their many health benefits. As a weight loss drink: Drinking a glass of water with a tablespoon of apple cider vinegar in it is known to be very effective for weight loss. This is because it is known to speed up metabolism. Those who drink this regularly in the morning on an empty stomach are also known to experience fewer hunger pangs throughout the day. Some studies suggest that it also helps the body get rid of fat. As a mouthwash: Apple cider vinegar can be used as an effective mouth wash. Apple cider vinegar can help keep your teeth clean by preventing cavities and tooth decay. However, you must be careful while having apple cider vinegar as its acidic nature can erode your tooth enamel. The best way to use it for your teeth would be to dilute it in salt water (about 1 tsp in a cup of water). Use this as a mouth wash.
For clearing out dandruff: Apple cider vinegar can be put into your hair mask to help clear your scalp of dandruff. Dilute apple cider vinegar with some lemon juice and apply this on your scalp. Keep it for about 20 minutes and then wash off. 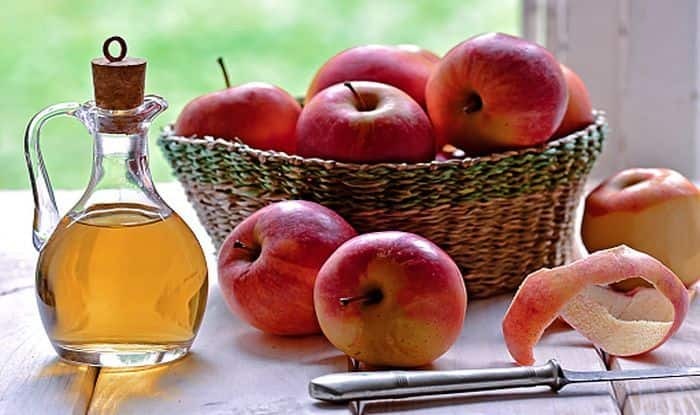 To help lower cholesterol: The acetic acid in apple cider vinegar enables the body to lower the bad cholesterol or LDL and triglyceride levels. It is no wonder then that it is considered ideal for heart patients.